THROW BLANKETS are smaller blankets, often in decorative colors and patterns, that can be used for extra warmth and decoration on the outside of bed. a & R Cashmere - since 2005. Alpaca, cashmere, silk & wool throws. ANICHINI - since 1985. "Enlightened Luxury." Luxury throws: Hand Loomed Cashmere Throws, Silk Sateen Throws, Oversized Bed Throws & Washable Throws. DEA - "Create your own 'Home Living' with Dea." Cashmere throws. Frette - since 1860. "Throws & blankets." Georg Jensen Damask - since 1756. "Exclusive dark blue and army green woollen throw in the finest, softest lambswool." LIGNE ROSET - "Synonymous with modern luxury & invites consumers to revel in a contemporary, design-forward lifestyle." 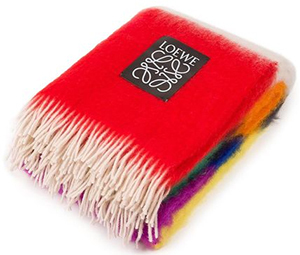 LOEWE - since 1846. Multicolor Stripes Blanket Multicolour. Olivier Desforges - since 1973. Ritz Paris Essential - cashmere throws.